An unforgettable night out on the town lies ahead with the Epic Toronto Night Tour. Your evening starts by watching the sunset atop the CN Tower, followed by a guided tour through the streets, and ends with you stopping to take in a dazzling view of the entire city. 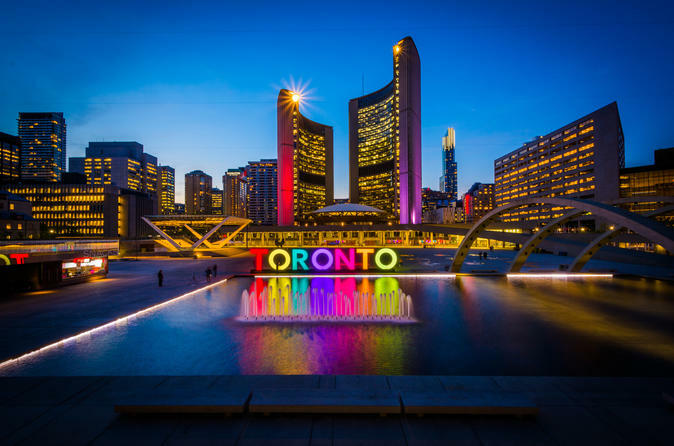 Getting a nighttime look at popular area attractions such as the illuminated Toronto sign, Yonge-Dundas square, and Old Town. Our complimentary shuttle will pick you up while it is still daylight so you have plenty of time to see everything from the beautiful sunset to the nightlights coming alive. We will navigate the busy streets and get you to your first stop on the tour – the world-famous CN Tower. The tour nears its end with a quick drive by local government buildings and the University of Toronto. The last stop on the tour is perhaps the most memorable – standing atop the Don Valley as you take in a hilltop view of the entire dazzling lights of Toronto.